Italy and Brazil have their Histories strongly linked. The first Italian Ambassador, Gabriele Galateri di Genola, arrived in Brazil in 1859, even before the modern Italian State had finished Reunification. The Italian culture influenced Brazil in many different ways and reached also the music, not only with traditional Italian songs but also with the merging with other Brazilians music styles. 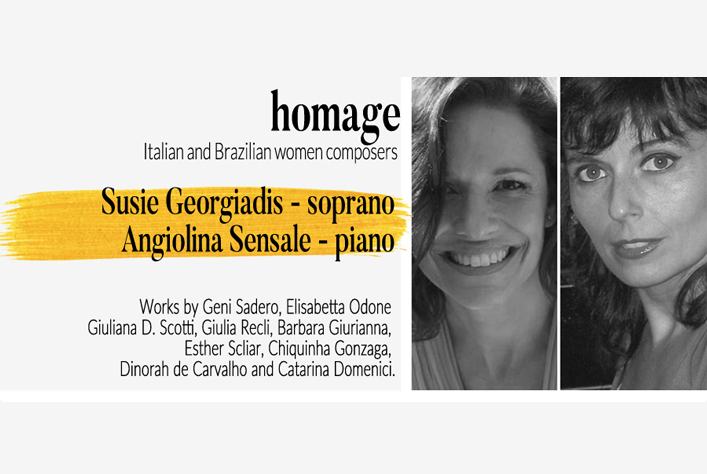 Brazilian soprano Susie Georgiadis and Italian pianist Angiolina Sensale pay homage to their home countries and their women composers presenting a programme of full of history, colours, and musical richness. HOMAGE includes a few world première recordings by several historical composers as well as new works written by Catarina Domenici.